The Philippines saw 2014 as a successful year in tourism with more tourists visiting the country. According to the Department of Tourism, inbound visitors during the year grew by 3.25%, while total earnings from inbound tourism increased by 10% against previous year’s earnings. This upward trend drove Globe Telecom, together with trusted one-stop online travel solutions site AsiaTravel.com, to offer tourists exclusive connectivity deals that will allow them to stay in touch anytime, anywhere with the Globe Traveler SIM and the TravelSurf promo. “The Philippines is rapidly becoming a destination hub for tourists worldwide on the back of our booming economy and top vacation spots. In order to complete their travel experience in the country, we at Globe aim to be their connectivity partner of choice with our innovative and affordable deals. With our Traveler SIM and TravelSurf promo, we give them an easier and more cost-effective way to stay in touch whether through calls, texts or mobile data to access their social media accounts,” shares Globe SVP for International Business Rizza Maniego-Eala. Available to Philippine tourists, the Globe Traveler SIM offers local rates for calls, texts and mobile data services. With the Traveler SIM, users can call abroad for as low as US$0.40 per minute; receive calls and SMS from abroad for free, and cut costs on mobile data with a TravelSurf promo. With TravelSurf, users can access the Internet on mobile for only P500 for seven (7) days or P1,000 for 30 days. 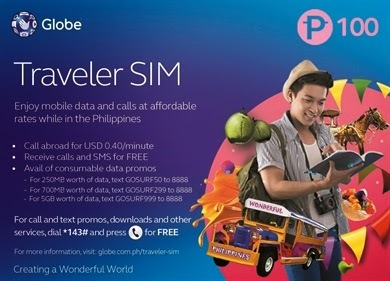 With the Globe Traveler SIM and the TravelSurf promo, tourists can connect with their contacts from around the world through calls, texts, and mobile internet, enabling access to instant messaging, social networking, e-mails and search engines, as well as their favorite apps. They also get the best treats that include free Globe mobile internet services or free AsiaTravel vouchers. Travelers who booked their trips in the Philippines via www.AsiaTravel.com will also get a free Traveler SIM loaded with free mobile internet service. Tourists get a minimum of 2 days free mobile internet access for an overnight stay in the Philippines to as many as 30 days of free mobile internet access for a 16-night stay or more. Once booking is confirmed, the tourist is automatically entitled to this offer and may claim their free Traveler SIM upon arrival in the Philippines. They just have to present their confirmation vouchers at any AsiaTravel office in Manila, Cebu or Davao or at the Globe booth located at the arrival areas of the Ninoy Aquino International Airport (Terminals 1 and 3) in Manila, Clark International Airport in Clark Field, Pampanga, Mactan-Cebu International Airport and Francisco Bangoy International Airport in Davao. An authorized Globe representative will be activating and registering the Traveler SIM. Existing Globe customers who also purchase their own Traveler SIM or subscribe to a TravelSurf promo are also entitled to free Asia Travel vouchers which they can use in future bookings via www.AsiaTravel.com. A purchase of the Globe Traveler SIM will give the customer P500 worth of Asia Travel vouchers while a subscription to the TravelSurf7 or TravelSurf30 promo is equivalent to P1000 and P2000 worth of Asia Travel vouchers, respectively. Asiatravel.com offers a reliable one-stop service for travelers to find the best value for their flights, hotel rooms, holiday packages, sightseeing tours as well as theme park tickets. It has a selection of over 200,000 hotels and resorts worldwide, promotional airfares for over 500 major airlines and over 600,000 tours and travel packages. Asia Travel vouchers may be used to offset payment when booking on a wide range of prepay hotels, air tickets, tour packages, and attractions and theme parks via www.AsiaTravel.com. To know more about the Globe Traveler SIM, TravelSurf Promo and the Globe & AsiaTravel promos visit: globe.com.ph/traveler-sim. Promo is valid until June 15, 2015; Redemption period is until September 1, 2015 and booking period is until December 15, 2015.